Author: Menzies, Gavin Set In . . . The brilliance of the Renaissance laid the foundation of the modern world. Textbooks tell us that it came about as a result of a rediscovery of the ideas and ideals of classical Greece and Rome. But now bestselling historian Gavin Menzies makes the startling argument that in the year 1434, China—then the world's most technologically advanced civilization—provided the spark that set the European Renaissance ablaze. From that date onward, Europeans embraced Chinese ideas, discoveries, and inventions, all of which form the basis of Western civilization today. 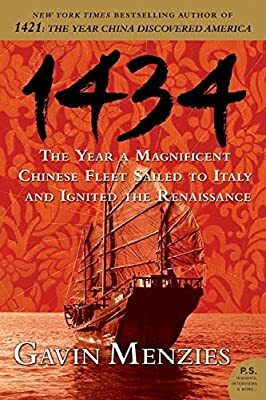 The New York Times bestselling author of 1421 combines a long-overdue historical reexamination with the excitement of an investigative adventure, bringing the reader aboard the remarkable Chinese fleet as it sails from China to Cairo and Florence, and then back across the world. Erudite and brilliantly reasoned, 1434 will change the way we see ourselves, our history, and our world.